Our passion and purpose coexist to serve this industry with the kind of dedication, skill and integrity that establish meaningful relationships. Our mission is to be the best at what we do. We strive to deliver quality projects with the most reliable, efficient, and cost effective methods. We implement an intelligent & cohesive strategy -- conquering the complexities of commercial refrigeration. We know that our reputation is only as good as our results. That's why we pride ourselves on a results-oriented approach. Albert is a state licensed General, Mechanical and Electrical Contractor, with 28 years of experience in his field. He is sought after as a forward thinking expert in the cold storage industry, developing systems, equipment & strategies that optimize & improve operations — obtaining high-levels of efficiency and carbon footprint reduction. He performs analysis and value-engineering for the conceptual design, sizing, & specifications--all vital to the project’s overall systems and operations. Albert has a hands-on approach to ensure that construction quality and progress proceed according to our customers’ specifications and distinct project demands. ‘Jenny’ holds a degree in Industrial and Organizational Psychology from Florida International University. She oversees contract management and is a CAD designer with extensive knowledge & experience in the details that deliver a comprehensive project. Jenny is also very proficient in navigating through the municipal plans review & permitting process. Our customers come to rely on her skillful approach to finding solutions that turn challenges into opportunities for improvement. 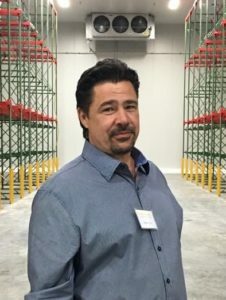 "My goal is to understand & anticipate our customers' specific needs, and deliver a very solid, reliable and efficient facility that improves their day-to-day operations & enhances their bottom line." Our family business is rooted with great care and commitment to the promise of integrity & quality for all our customers. Our life's work in this industry, has led to true mastery, allowing us to become innovators in the future of commercial refrigeration. CONTACT US & DISCOVER HOW WE CAN EXCEED YOUR EXPECTATIONS.